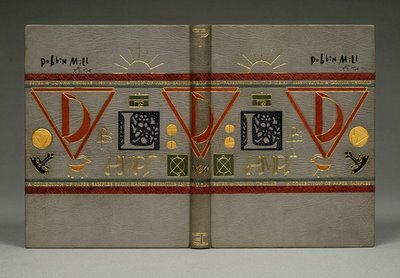 "Tight back French style binding; sewn on vellum strips; split boards, wide raised bands; bound in ivory calf with Morocco onlays and blind tooling; double headbands in silk; leather joint; endpapers are reproduced 1891 maps of New Mexico; cross ornament on spine made from handmade tool carved from brass. 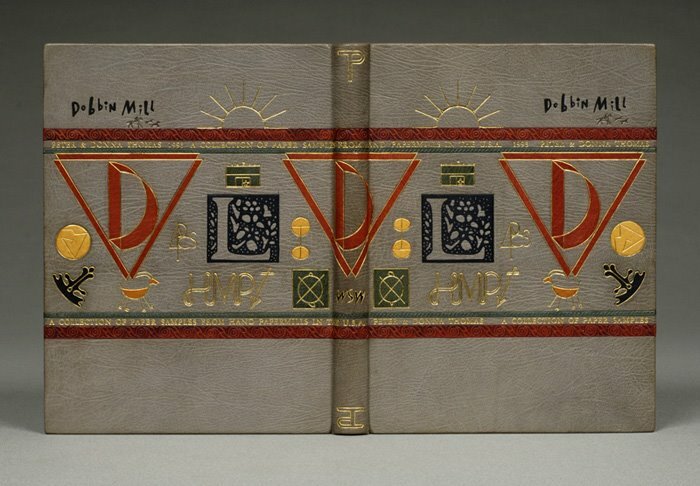 The cover design suggests the imposition of Christianity over the Southwestern Pueblo Indian culture. 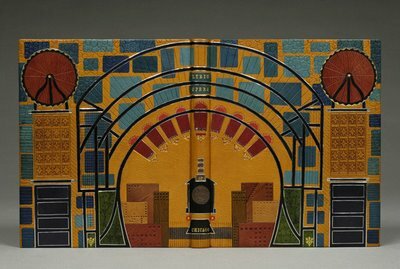 The spine is intended to resemble a bible’s binding; the Southwestern motifs are adapted from traditional Acoma pottery designs. 21 x 16.5 x 4 centimeters. Created 2005." "For me, Winter Palace suggested something both intricate and provisional. I sawed the front and back covers from a salvaged piece of old tongue-and-groove fir, and inset piano hinges to form the basic structure. 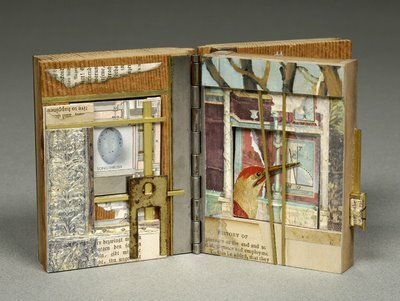 Meant to function as a sort of stage set or curiosity cabinet, it contains two removable books with 2" square pages. These are perfect bound with Japanese repair tissue and Tyvek, after a board book structure developed by Hedi Kyle. Materials include reclaimed fir, walnut, birch aircraft plywood, basswood, various metals, glass, mirrors, Tyvek, found objects and paper. 11 x 9 x 6.5 centimeters. Created 2006." 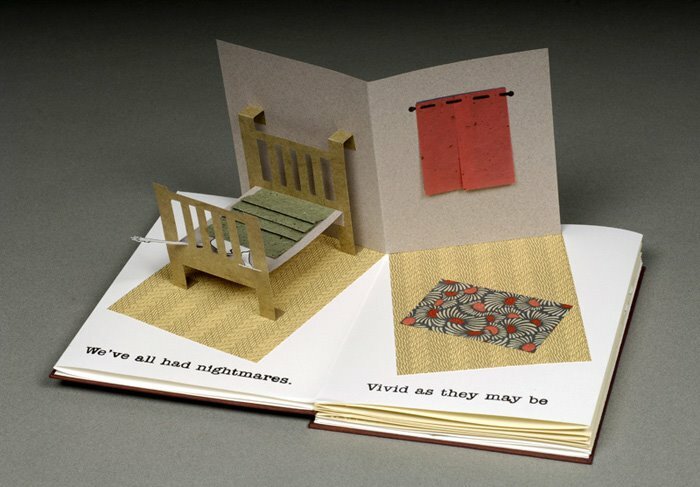 "Sleepers, Dreamers & Screamers is an accordion pop-up book, printed letterpress with hard covers. The pop-ups are constructed of a variety of papers including a cotton and gampi paper made for the project by Bridget O’Malley of Cave Paper. The complete text is “We’ve all had nightmares. Vivid as they may be there is always that sweet release upon waking. But what happens when events in our waking lives surpass even our most horrific dreams. Where is our release now?” This book was begun in 2001 and derailed by the events of September 11, 2001. The text was rewritten in the aftermath and finally completed. 24.5 x 18.5 x 2 centimeters. Created 2006." 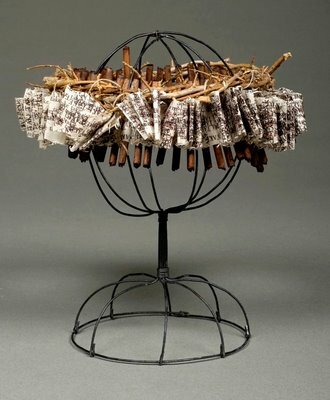 "Crown of Thorns is meant to communicate the concept of sacrifice, using an easily recognizable symbol. 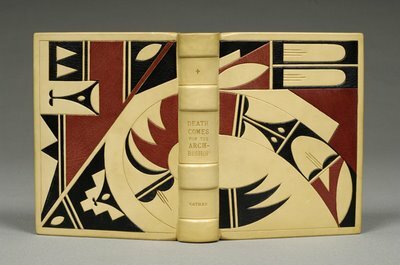 This book was letterpress printed in an edition of three. The pages are overprinted off-register purposefully, to look as though the word “take” is being sacrificed — it’s taken away a little each page, until all you’re left with is one simple statement in red — take what you want from me, you deserve it all. The pages were then roughly trimmed and bound in piano hinge format, using acrylic stained dowel rods. A crown of thorns was attached with hemp cord and the structure is then displayed on an antique wig stand. 30 x 30 x 30 centimeters. Created 2005." "Binding edged in black leather; sewn on recessed cords; brown and rust Japanese paper endleaves; brown, rust, purple, and gold handsewn silk endbands; top edge gilt, colored and gauffered; décor of multicolored leather onlays and gold and white tooling. 27 x 18 x 3.5 centimeters." Undated. 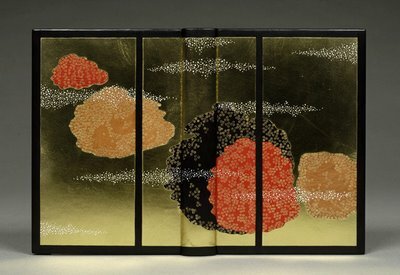 "This is the original work of the form that has become known as the “Flag Book.” It is the single most influential structure in the world of contemporary bookmaking. 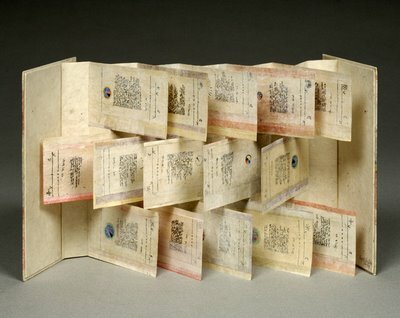 This method of construction, employing tipped on page fragments on alternating sides of a concertina structure, has been adopted by artists worldwide for the creation of unique and multiple bookworks. 26 x 14 x 1 centimeters. Created 1979." "Bound in full gray Oasis goat skin; pastedowns of Dieu Donné “antique linen” with Nancy Pobanz’s “pampas grass” decorative flyleaves; sewn on linen tapes; gray and red silk endbands; multicolored leather onlays with gold and blind tooling made up from watermarks of participating papermakers. 30 x 23 x 3 centimeters. Created 1996." 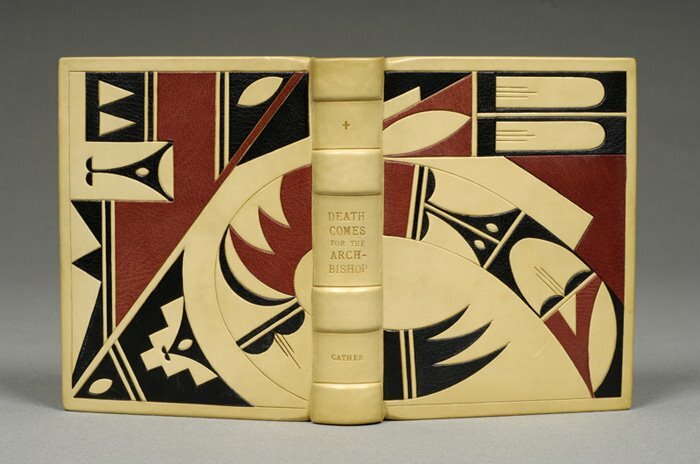 "Bound in full taupe goat skin in French style; sewn on frayed out cords; black paper endleaves; graphite top edge; black, blue, and white silk endband; décor of multicolored leather onlays with blind and gold tooling. 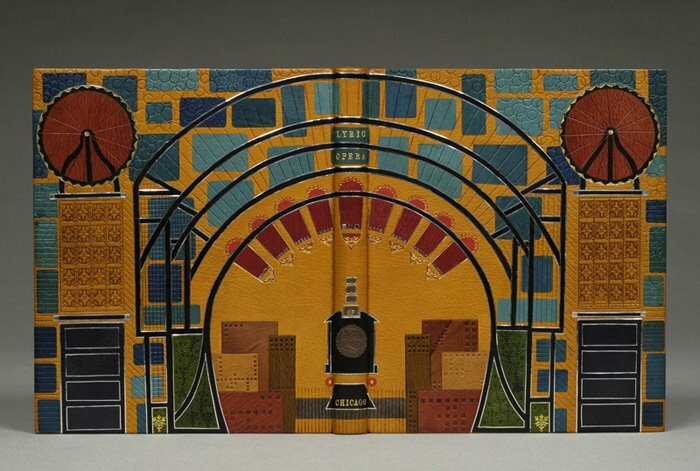 The design was derived from an original stage setting for the Tales of Hoffmann. 31 x 26 x 4 centimeters. Created 1981"
Addit: Hm, the compressing of uploaded photographs to fit the page dimensions really make some of them look ordinary. I swear they are all in fact beautiful pictures if you click on them. 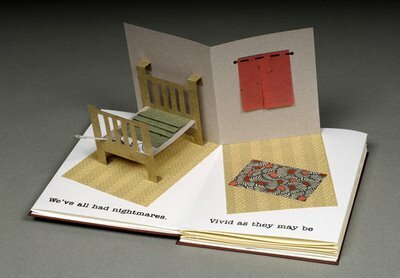 That pop-up book is so cool - I wish I could flip through it. Also, one quick question- which do you think beadwork is - an art or a craft??? In all honesty, I don't really have much of an opinion. It's a case where I'd need to see a piece: 'I don't know what art is, but I know it when I see it'.